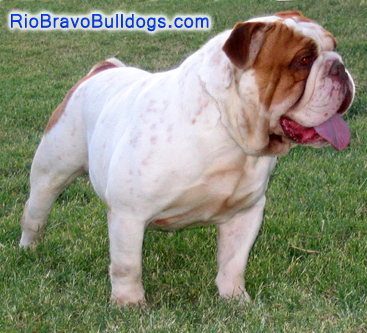 About Rio Bravo Olde English Bulldogges. 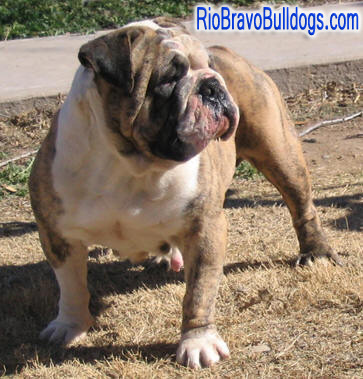 Rio Bravo Bulldogges was established for the most part in early 1992, however we began our journey in the dog world earlier by competing in the conformation show ring, obedience training and breeding various bully breeds in 1987 with the United Kennel Club. 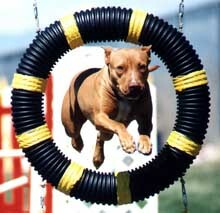 In those early years we owned and produced several UKC & ADBA conformation Champions and Grand Champions. We also have produced several dogs that have gone on to earn titles in agility, obedience, the German canine sport of schutzhund and weight pulling. 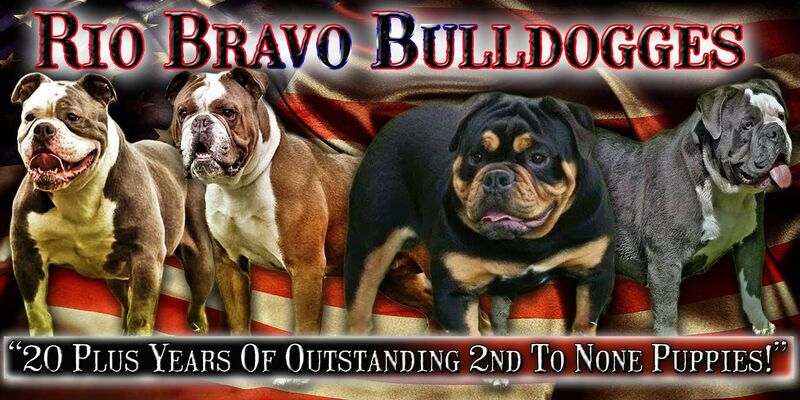 Over the past 20 plus years we have had the pleasure of owning or being closely associated with a diverse variety of Bull and Molosser breeds such as the American Pit Bull Terrier, American Bulldogs, Boston Terriers, Boxers, Dogue De Bordeauxs (French Mastiff), Neapolitan Mastiffs, Valley Bulldogs, Bantam Bulldogges, English Bulldogs, French Bulldogs, Olde Boston Bulldogges and our favorite the Olde English Bulldogge. 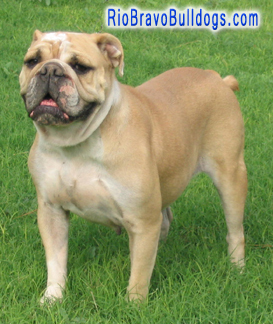 In 1992 along with a few friends we began working on a small breeding program of our own line of Olde English Bulldogges. 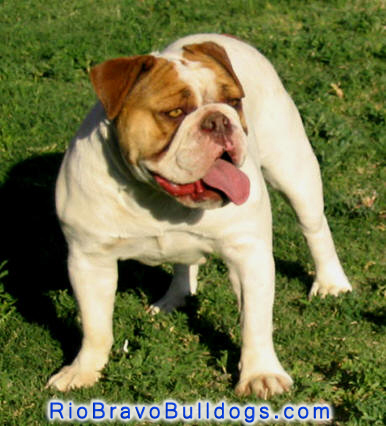 We initially purchased our first multi generational Olde English Bulldog from our friend Mr. Craig Green (R.I.P.) of Gallant Farms. This dog was a brother to the famous Hermes Dio, his name was Gallant's Angus. Shortly afterwards we also acquired a few dogs from Vera Rangel of Crossbow Farms and the MacIntoshs of Mighty Mac Kennels. 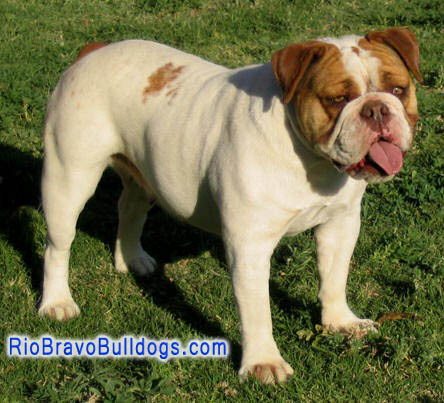 However for the most part the majority of our Olde English Bulldogges in those early years were the result of our own foundation crosses / breedings. 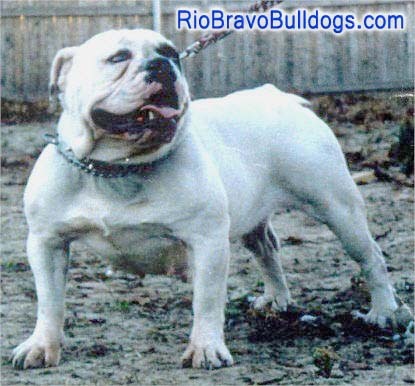 Today the Rio Bravo bloodline still carries the genetics from many of those original combinations that we did in the early 1990s. 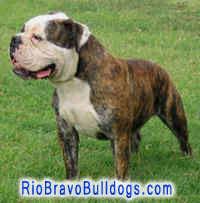 After a year or so of working with our Olde English Bulldogge breeding program, in 1995 we with a friend came up with the conceptual idea of founding and establishing the world's first breed specific registry for Olde English Bulldogges, where all Olde English Bulldogges regardless of bloodline could be recognized. This new registry would allow other breeders to document the heritage and develop their own lines of Olde English Bulldogges as a result the International Olde English Bulldogge Association (IOEBA) was established in 1995. In the year 2002 two huge changes took place in our families' lives. The first was our family became followers of our Lord and Savior Jesus Christ. We were baptized as a family in El Paso, Texas at Harvest Christian Center with pastor Eddie Lee. The second change was that our family became the exclusive owners of the International Olde English Bulldogge Association (IOEBA) and became solely responsible for its day to day operations. Both of these changes were very dramatic and brought about great changes in our lives.